You never know what features of a vehicle will make it the right choice for you to dart around Turnersville. Some people want the utility of an SUV while others prefer a vehicle that is enjoyable like a typical car. The 2018 Volkswagen Golf SportWagen has features that drivers in both of these camps can appreciate. You are smart with your money and you would like to be smart as you choose a vehicle to purchase. Did you know that one popular way of getting high quality vehicles for low prices is to purchase through the Volkswagen Certified Pre-Owned program? There are many different pre-owned Volkswagen vehicles available to you today. It is important for any vehicle that has been driven to be tested to make sure that it is ready for more use. Through CARFAX, the program gives you access to a comprehensive report of your vehicle's history. This report includes all kinds of essential information regarding your vehicle's history on the road, including accident reports and known issues with the given model. 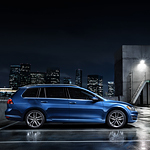 The Volkswagen Golf Sportwagen is a popular yet roomy family and hauling wagon. This vehicle is known for its stylish looks, and includes a number of specialized security and entertainment systems. Drivers and passengers alike can benefit from the proprietary Front Assist system. This makes driving easier by augmenting driver efforts when braking, and also includes special pre-collision sensors that can augment driver vision and attention. This vehicle is also vigilant on the rear end, and includes a special rearview camera that gives drivers views of everything behind them. Pets can add plenty of benefits to our lives, and it's important to keep them safe as they travel along with us. Vehicle manufacturers are innovating designs to make cars more pet-friendly, but there are also steps we can take to ensure our pets are safe and comfortable in the car. While most dogs like to sniff the breeze through an open window, it can be dangerous to allow them to have their heads outside the car. Keep the window open just a few inches to they can still enjoy the fresh air without endangering them. Are you looking for an SUV that will give you the kind of performance that you need when you are on the road? Consider the popular mid-size family option that is the Atlas from Volkswagen. You will find that this vehicle is all that you are seeking. The weather on a certain day can affect the way that your vehicle performs on that day. The weather can mess with your driving and put you in dangerous situations. The Volkswagen Atlas comes set up with 4Motion with Active Control that helps your vehicle stay easy to drive in difficult conditions. Take your music to the next level in the Volkswagen Passat. This popular mid-sized sedan boasts a high-quality infotainment center. It's also available with a premium audio system that can make your favorite songs sound great. When you get inside the Passat at Prestige Volkswagen, you'll notice the large infotainment screen on the dash. This feature-rich system allows you to listen to music a number of different ways. In addition to standard AM/FM signal, the equipment is also capable of connecting to satellite radio.